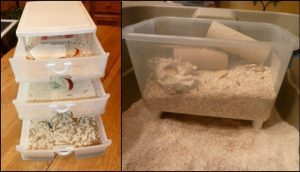 This is an easy and inexpensive project that your cat will surely love! Cats are pretty fun to have around. They can be playful, perpetually curious, and loving – well, at least depending on their mood. One particular thing that I love about them though is that they are very independent, not very high maintenance, so to speak. I can go out the door and my cat won’t even bother to look at me. She’d have this nonchalant attitude that says she doesn’t care where I go, as long as there’s food. I love her for that. It’ll be hard to pry your cat away from this self-groomer! I was looking for something that will further encourage her independence. I was looking at cat videos on YouTube when I came across this project for a cat self-groomer. It was pretty easy so I decided to make one. The materials weren’t expensive so I decided to make two. The first time my cat used it, she was merely testing it out. After a couple of days, I must say, it was a hit! Wanna learn how to make this adorable self groomer for cats? Watch the video below.